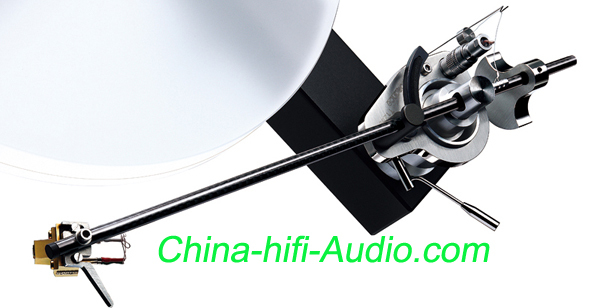 a) The CONSONANCE 9" tonearm has outstanding performance and great flexibility.This arm stands directly within our company moto, "Simple Human". Their simplicity is what makes it not only look and feel better but also perform better. b) With the oil damped pivot this arm can accept almost all types of MM and MC cartridges with no difficulty, heavy or light cartridges are not a problem. We at Consonance have strived to make an afforable arm with a low set up time so that you can enjoy it quickly after getting it. c) It has a totaly clean look, there are no extra 'gadgets' to get in the way. It is designed for listening pleasure not for it looks, but don't let that fool you. Its looks are very pleasing but the sound is what will really make you satisfied. d) Our unique arm has:1. A single rounded point unipivot bearing. 2. Carbon fibre arm tube. 3. Oil damping and low mass, excellent for MC cartridges. 4. Separate adjustments for VTA and Azimuth. 5. Easy anti-skating adjustment.